Create a GROUP for RCIA candidates as they enter into mystagogy. Encourage use of the Daily Readings. Tap the READINGS button and follow the Lectionary for appointed readings for each day of Holy Week. The BEST, BEST, BEST message is one that is from the parish priest. Push a message from Father around 3:00 pm on Easter Sunday. Add Holy Week Confession & Mass Times to the Admin Portal. Update 3.13 allows content to update quicker when changes are made. As guests move throughout the building during Lent and Easter, be sure to have download cards and myParish App banner in accessible and visible locations. Something cool we discovered, take your iPhone (sorry Android users) and open the Camera on the phone. Place the camera over the QR code on the banner and viola! 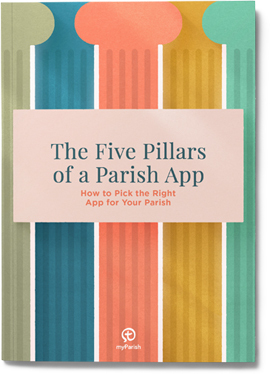 The phone installs the app or moves to your parish app instantly, how easy! You do not need a QR reader or take a picture, simply hold the camera over the QR code. Catechize and inform parishioners through messaging of the services before Holy Week. Include video links in the message.